Coming into this season, fans of both the Oklahoma Sooners and the Oklahoma State Cowboys were unsure of what to expect from their teams this year. Both teams came into the season with question marks on both sides of the ball, with the biggest mystery for both teams being what type of production would they get from the quarterback position. For Oklahoma, this was going to be the first time since the 2007 season in which they would have an open quarterback competition. Going into the fall, the competition had been narrowed down to two candidates: junior Blake Bell and freshman Trevor Knight. Bell was the unanimous favorite going into fall practices, due to his experience as a backup to Landry Jones for two years, as well as his great success in what had come to be called the “Bulldozer” package, in which he would use his massive size advantage to run through defenders. However, Knight is also considered a “dual-threat” quarterback, with his advantage being his speed and agility, and by the end of fall practices, head coach Bob Stoops surprised many by naming Knight the starter for the opening game against Louisiana-Monroe. Knight would take full advantage of the opportunity he was given, making a great impression on Sooner fans in his collegiate debut. Though he would only throw for 86 yards, he had three touchdown passes, as well as 103 rushing yards. 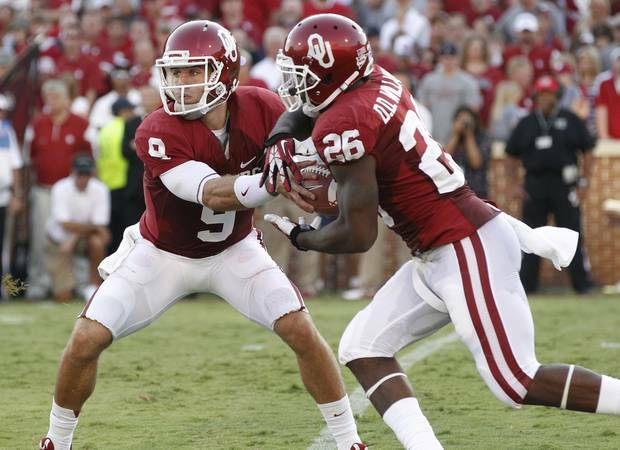 This is something that is somewhat new to Oklahoma fans, as they are accustomed to offenses led by largely one-dimensional quarterbacks, such as Jones and Sam Bradford, who would rely on passing from inside the pocket rather than extending plays with their legs. However, if Saturday night is any indication of things to come, this will more than likely be a change that is welcomed with open arms by the Oklahoma faithful (www.soonersports.com). The Cowboys came into the season with question marks surrounding the quarterback position because both players campaigning for the starting spot had very productive campaigns last season. The two candidates, senior Clint Chelf and sophomore J.W. Walsh, both saw playing opportunities last season, and both performed very well when given the opportunities. Walsh, who is very similar to Knight as far as playing style goes, saw action in 10 games last season after an injury knocked starter Wes Lunt out of the lineup and played well enough to be named the Big 12 Offensive Freshman of the Year by the coaches of the Big 12 Conference. However, he would also be injured, which opened the gate for Chelf, who would go on to start the final five games for the Cowboys, as well as earn Most Valuable Player honors in the Heart of Dallas Bowl at the end of the year. Going into the season opener against Mississippi State, head coach Mike Gundy stated that he would use a two-quarterback system, trying to use the strengths of both Chelf and Walsh to help the team. However, on the third series of the game, Walsh would enter the game and would not look back, finishing with 135 yards passing to go along with 125 yards on the ground. His performance would prompt Gundy to name him the starter for the next game and, presumably, for the rest of the season, putting the Cowboys into a similar position as the Sooners, as they are just as well known for having a dynamic passing game as the Sooners are (www.okstate.com). Overall, both Oklahoma and Oklahoma State have to be pleased with their performances in their season openers. Though the playing styles may be polar opposite to what the fans are used to seeing, it provides intrigue and entertainment for those watching, simply because they have no idea what is going to happen next. Additionally, if the season openers are any indication of things to come, the success of the new offensive styles is going to be very difficult to argue with.